Natural Design. Pecha Kucha, Tallahassee. The many uses of the model system Drosophila melanogaster. E&E seminar, Florida State University, Tallahassee, Florida, USA. 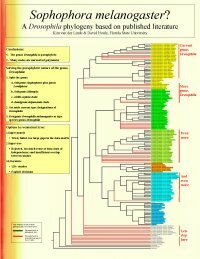 The fate of the genus Drosophila in modern systematics. 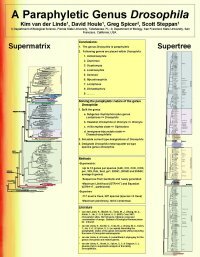 Drosophila Evolution: Taxonomy, Systematics, Phylogenetics and their Relationships to Drosophila Biology, San Diego, CA, USA. Localizing shape variation in Drosophila wings across the family tree. Evolution 2008, University of Minnesota, Minneapolis, Minnesota, USA. Poster: "A Paraphyletic Genus Drosophila" 49th Annual Drosophila Research Conference, San Diego, California, USA. Invited presentation: "Zaprionus indianus." Studying invasive insects using bioinformatics tools, the 90th Annual Meeting of the Florida Entomological Society, Sarasota, Florida, USA. Invited presentation: "Procrustes & the many noses of Pinocchio: Revealing allometric variation in shape." Shape Day in Statistics , Flordia State University, Tallahassee, Florida, USA. Presentation: "Procrustes & the many noses of Pinocchio: Revealing allometric variation in shape." Evolution 2006, Stonybrook, New York, USA. Presentation: "Drosophila and their wings." E&E seminar, Florida State University, Tallahassee, Florida, USA. Presentation: "From laboratory to field: lessons from a Drosophila field study." Xth congress of the European Society for Evolutionary Biology, Jagiellonian University, Cracow, Poland. Presentation: "A comprehensive analysis of wing shape and size across the family Drosophilidae." Evolution 2005, Fairbanks, Alsaka, USA. 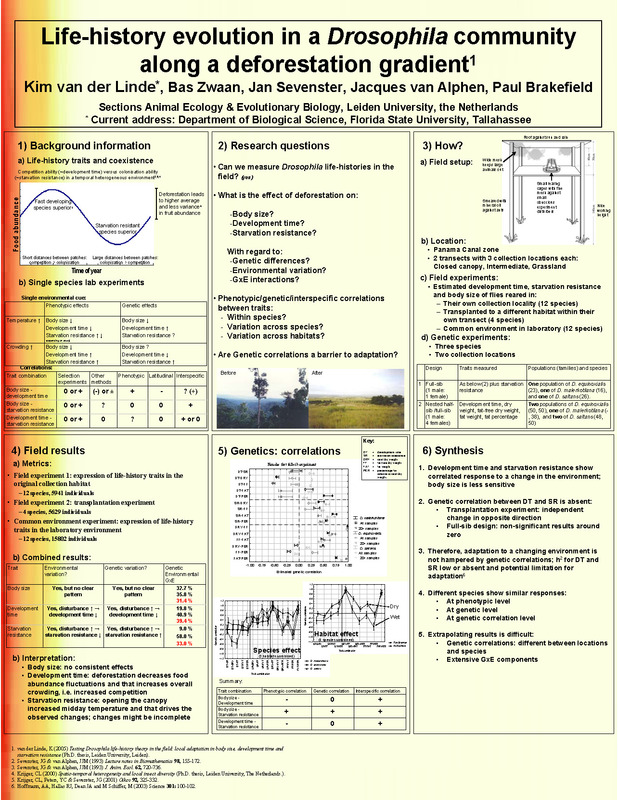 Poster: "Life-history evolution in a Drosophila community along a deforestation gradient." Center for Community Genetics 2005 Symposium, University of Minnesota, Minneapolis, Minnesota, USA. 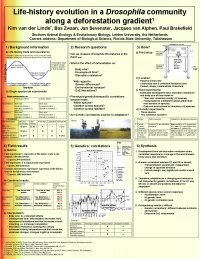 Presentation: "Drosophila levensloop theorie getest in het veld: locale aanpassing in lichaamsgrootte, ontwikkelingstijd en hongerresistentie." Leken praatje Universiteit Leiden voorafgaand aan openbare verdediging proefschrift. Leiden, The Netherlands. Presentation: "Drosophila species wings: so similar, but still distinctive." 16th annual meeting of the Netherlands Entomological Society, Groningen, The Netherlands. Presentation: "Testing Drosophila life-history theory in the field." Florida State University, Tallahassee, Florida, USA. Presentation: "Allometry for sexual size dimorphism in Drosophila." 15th annual meeting of the Netherlands Entomological Society, Groningen, The Netherlands. Presentation: "Interspecific variation in genetic correlations in Drosophila." 3rd Annual Dutch fly meeting, Utrecht, The Netherlands. Presentation: "Genetic correlations viewed from a different angle: making sense of contradicting results." 10th Benelux Congress of Zoology, Leiden, The Netherlands. Presentation: "Genetic differences on a local scale." IXth congress of the European Society for Evolutionary Biology, Leeds, United Kingdom. Presentation: "Measuring starvation resistance in the field?" Stress symposium at Rønbjerg, University of Århus, Denmark. Presentation: "Deforestation and local adaptation of life-history traits." Verwey-PhD meeting, Texel, The Netherlands. Presentation:"Does habitat destruction always lead to loss in biodiversity?" 13th annual meeting of the Netherlands Entomological Society, Amsterdam, The Netherlands. Poster: "Habitat-linked variation in life-history traits in Drosophila." VIIth congress of the European Society for Evolutionary Biology, Barcelona, Spain. Presentation: "Changing habitats, changing populations? 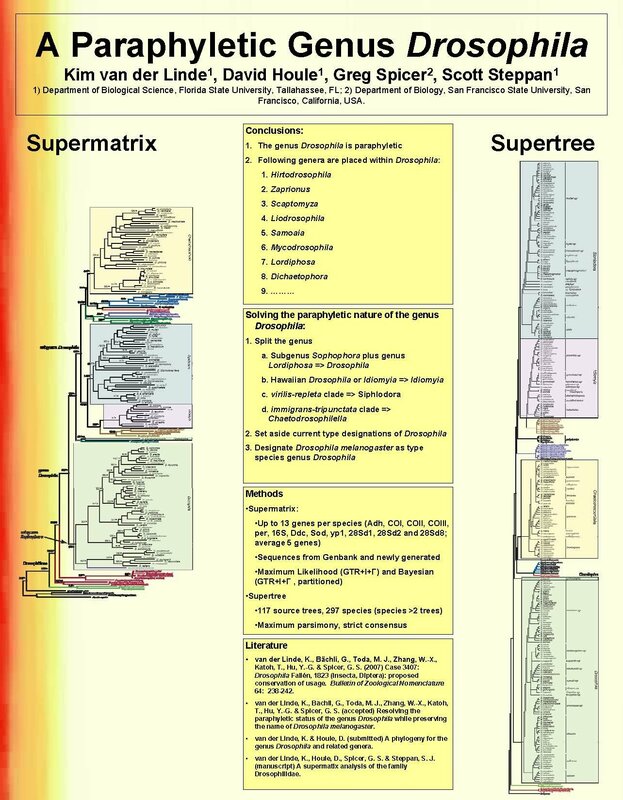 Life-history evolution of coexisting Drosophila species in a heterogeneous environment." University of Pennsylvania, Philadelphia, USA. Presentation: "Changing habitats, changing populations? 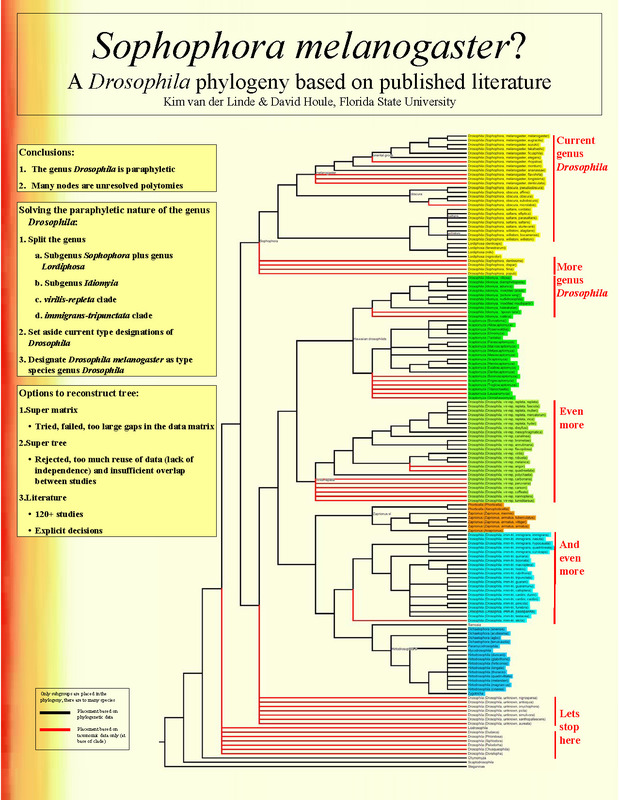 Life-history evolution of coexisting Drosophila species in a heterogeneous environment." BAMBI, Smithsonian Tropical Research Institute, Barro Colorado Island, Panama. Presentation: "Exploring the use of the Drosophila genus as biodiversity indicator. Research for the Sierra Madre Forest." 2nd conference of CVPED, Isabela State University, Cabagan, The Philippines. Poster: David Houle & Kim van der Linde "Relating among species divergence to mutation and standing variation". 49th Annual Drosophila Research Conference, San Diego, California, USA. Presentation: Fiona Smyth, Kim van der Linde & David Houle: Sexual selection and the fisher process. Evolution 2006, Stonybrook, New York, USA. Poster: Jarkko Routtu, Dominique Mazzi, Patricia Mirol, Kim van der Linde, Roger K. Butlin & Anneli Hoikkala: "Genetic versus phenotypic divergence in Drosophila montana." Xth congress of the European Society for Evolutionary Biology, Jagiellonian University, Cracow, Poland. Poster: Fiona Smyth, Kim van der Linde & David Houle: "Influence of genetic system on the evolution of female preference by the Fisher Process." Evolution 2005, Fairbanks, Alsaka, USA. Poster: Minyoung Yi, George Gilchrist, Kim van der Linde & David Houle: "Sexual size dimorphism and phylogenetic trends in Drosophila species." Evolution 2005, Fairbanks, Alsaka, USA.